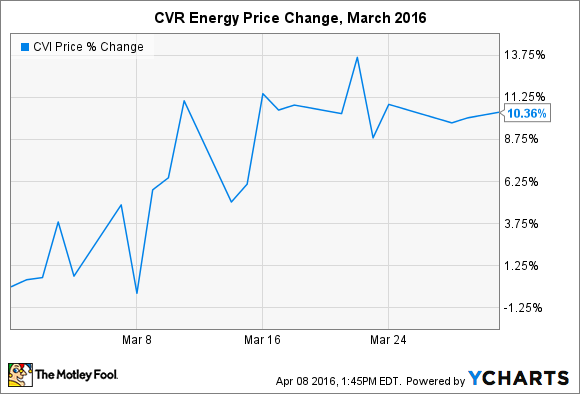 CVR Energy shares bounced 10% higher last month. Here's what you need to know. What: Shares of holding company CVR Energy (NYSE:CVI) jumped 10% in March after the two general partners that it controls -- CVR Refining and nitrogen manufacturer CVR Partners -- enjoyed even better monthly gains of 15% and 19%, respectively. So what: This is a pretty volatile investment because of the messy structure of the organization. As a holding company, CVR Energy's fortunes are tied to the operations of CVR Refining and CVR Partners. When they generate cash flow, it is distributed to shareholders -- including CVR Energy -- and then CVR Energy distributes that cash flow it receives to its own shareholders. (Fellow Fool Matt DiLallo summarized the complex structure last month.) In short, volatility is the name of the game. And although CVR Energy has historically paid out a fixed dividend each quarter, that may be in doubt now given the relatively poor performance of its major investments. Investors should keep in mind that CVR Energy has fallen nearly 38% since the beginning of 2016 thanks to less-than-stellar 2015 earnings from CVR Refining and CVR Partners. So a 10% pop -- or decline -- in any single month this year may be the norm. Now what: Until the current commodities squeeze stops pressuring petroleum and agriculture companies, CVR Energy will remain a volatile investment. Worse yet, its distribution may be at risk of getting chopped. Investors looking for above-average yields may be better suited looking elsewhere.